The phrases ‘must visit’ and ‘must see’ when it comes to places you should go in the World are often criminally overused. What is astounding to some may seem like ‘just another building’ to others and in the travel community it’s always important to tone things down a little and let others be the judge of what they should see or where they should go. Some places and events however do very much fall into the ‘must see’ category and can be universally agreed about, one such event is the great wildebeest migration. 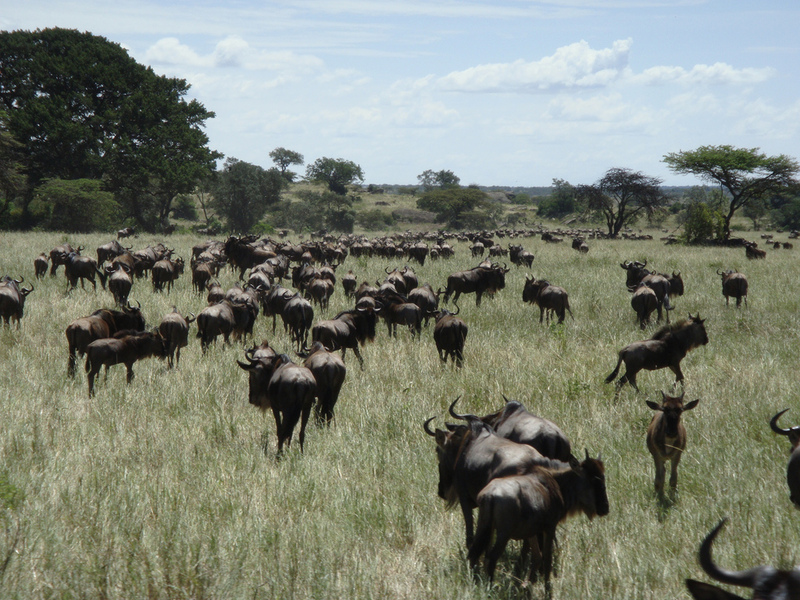 This migration of hundreds of thousands of wildebeest from the Serengeti as they seek out fresh, grassy lands is an incredible natural phenomenon and one that you will be simply in awe at the sight of. Here is a quick guide to the migration and where you can see it best. The cycle of the migration itself takes a full year to complete meaning that you have the opportunity to see this movement of animals at any time of the year in different locations. In late November/December, the wildebeest arrive onto the plains of the Serengeti, they stay here chomping away on the grassy through January, February and March before gradually moving west. In April they start their journey north. When it gets to May, areas like Moru Kopjes and west of Seronera become packed with thousands of wildebeest, zebra and gazelles. By June, the animals start to congregate along the south side of the Grummet River, the migration is slowed somewhat by the waters here and the western corridor sees huge groups of animals build before they take on the challenging, and often deadly river crossing. Those who survive the harsh river crossing and those who managed to escape the crocs then continue their journey north and in July and August the majority of the wildebeest can be seen in the Grumeti Reserve and Ikorongo. Once September comes around, the migration, at this time in the northern Serengeti, face their toughest task yet, crossing the dangerous Mara River, a vast and rapid river that takes many victims during this migration. As brutal as this may sound, this is one of the most exciting times to watch the migration, the unity and at times selfishness of the wildebeest as they seek to cross the river is astounding. As October arrives, the migration heads south through western Loliendo and the Lobo area of the Serengeti national park as they return to the lush green shoots of grass in November before starting the entire cycle again. Visiting Kenya’s Masai Mara or the Serengeti at these times will give you the perfect opportunity to see one of nature’s truly great events. Many locations offer specific tours where you can see the wildebeest in action and some even offer the chance to take a helicopter flight over the thousands of animal to see them take on their at times perilous search for grassier plains.